The property is within walking distance from many places of cultural interest, like the Prado Museum or Buen Retiro Park, which are 20 minutes' walk away. Room or bed reservations remain the day of arrival until 20.00 hours unless written notice of late arrival to the hostel. After this time, without having received notice of late arrival, the reservation will be cancelled. Great staff, and the location is perfect. The beds and bathrooms are clean and comfortable. The only negative thing I have to say is that in the rooms the outlets are all located in the same space, so charging your phone can be inconvenient. Also the wifi didn't work well in my room, but that could have just been my phone. Overall I would definitely recommend it to any traveller. The staff was excellent and incredibly helpful, especially Carlos. Great location and you can easily get out of the touristy hub and see the beautiful parks of Madrid. The only reason for a lower rating is the shared bathrooms need some updating and the place was overall a bit uncleanly. Great stay with great staff and reasonable priced. Excellent location and did the job no bother. No frills just a nice place to stay for a few nights. Rooms looked slightly smaller than in pictures but and there could've been more toilets/showers, but other than that no complaints. David was nice at the front desk. Bathrooms out of toilet paper with wet floors and hair in shower. When you arrive you make your own bed. You also can’t use your own lock you have to pay for the locker. Good location though. 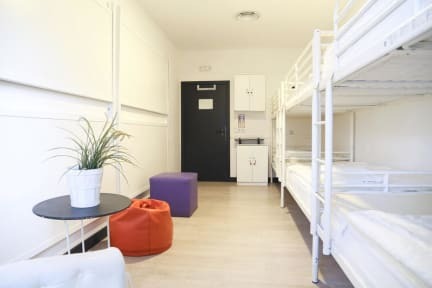 You definitely get what you pay for with this hostel. When I checked in, the guy working the front desk gave me a female dorm, which I didn't ask for, and then used this to try and pressure me to leave a good review. Well Carlos( he made sure I would remember his name) I'm doing what you asked. When I got there he was picking at a gross scab on his arm and went back to it several times while I was checking in. He also kept getting really close to me even though I was clearly uncomfortable. The staff made us wait for over 30 minutes to check-in, just sitting at the front. The staff member present acknowledged us briefly but did not help us check-in and actually left the desk multiple times while we were waiting at the front. We had to go track him down aftee another ten minutes before we could check-in. The facilities seem dated and old and there were no charging spots available near the beds. 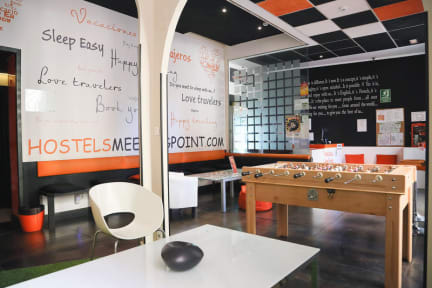 The atmosphere was not lively and the hostel did not try to create a community. Gym locker room smell and general dorm room vibe. Returned to hostel after dinner, leaned that the hostel locks the shower bathrooms at night, leaving only one shower for entire hostel. Awaken by staff banging on our door in the morning, “delivering” my clean laundry and unable to wait for us to wake up. Staff was rude and refused to tell me his name. No toilet paper, men hanging out in the womens bathroom while my girlfriend showered in a transparent stall, no front door security etc ... AVOID!